Suitable for all types Urinals and Troughs, Stainless Steel, Porcelain and Ceramic. Prevents blocked traps and pipes. Saves on Water Bills. Cleans and Freshens. "Ekam Eco Solutions Private Limited" started its operation in 2013, We are an eminent firm engaged in manufacturing a wide range of Sanitation and related infrastructure Products and Solutions. Urine harvesting for the places where sewer connections are not available. FRP Sanitation blocks along with toilet pans and urinals. Composting technology for domestic / industrial and community wet waste disposal. The offered products are designed chosen by our R&D teams.the products are maintained for its high quality, user convenience, light weight, low maintenance and long service life. 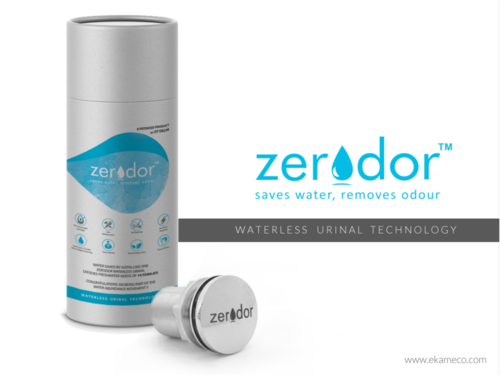 The Zerodor is a completely non-consumable and non-chemical based mechanical device. The device is a patented design which solves a typical contradiction of “ The liquid should pass but the gas should not pass”. The device is retrofittable to most of the standard urinal pans and hence does not demand to change your existing pan, if they are compatible. Dependent on the nature of the hydrophilic part the surfactants are classified as an-ionic, non-ionic, cat-ionic or amphoteric. Anionic surfactants. When the hydrophilic part of the surfactant consists of a negatively charged group like a sulphonate, sulphate or carboxylate the surfactant is called anionic. The difference with an anionic surfactant is that it is largely a synthetic chemical, and it has been designed to act not only as a surfactant that binds to oils and particulates in water, but also as a denaturing chemical for proteins.The negative electrical charge of their ionic nature makes them bind to dissolved minerals in hard water. These pre-cast panels are made with Textile Reinforced Concrete / Glass Reinforced Concrete. The panels are designed with a thickness of 20 mm and with a fibre content which provides for the necessary wind loads. The human waste which is not treated due to open deification or leaking drainage system or accumulated sewers causes dreadful disease. The bio-digester toilets are innovated by DRDO in India primarily for the defense personnel serving India in remote locations at very odd weather conditions. Here the requirements were to work in extreme cold. No discharge as there is no sewer, no sewer treatment plants. At EKAM we found that there is also a need of such technology away from these border areas and also for common people, who do not have access to a safe sanitation place due to similar difficulties. The anaerobic digestion of the human waste allows to exert only non harmful non odorous slurry which can easily be discharged to the fields and in soak pit as manure. These are stand alone toilet blocks made out of bio-digester tanks and EKAM-MoTo structures. Composting is a natural biological process, carried out under controlled aerobic conditions. In this process, various micro-organisms, including bacteria and fungi, break down organic matter into simpler substances.